Join historians Nina Cohen and Marilyn Wellons for a tour of “Captain’s Island, now known as Magazine Beach,” this Sunday, July 14 from 10:30-11:30am. Meet on the terrace of the powder magazine. For information about this and other Cambridge Discovery Day events, go to: www2.cambridgema.gov/historic/walks.html. Nina and Marilyn at last summer’s tour of Captain’s Island. 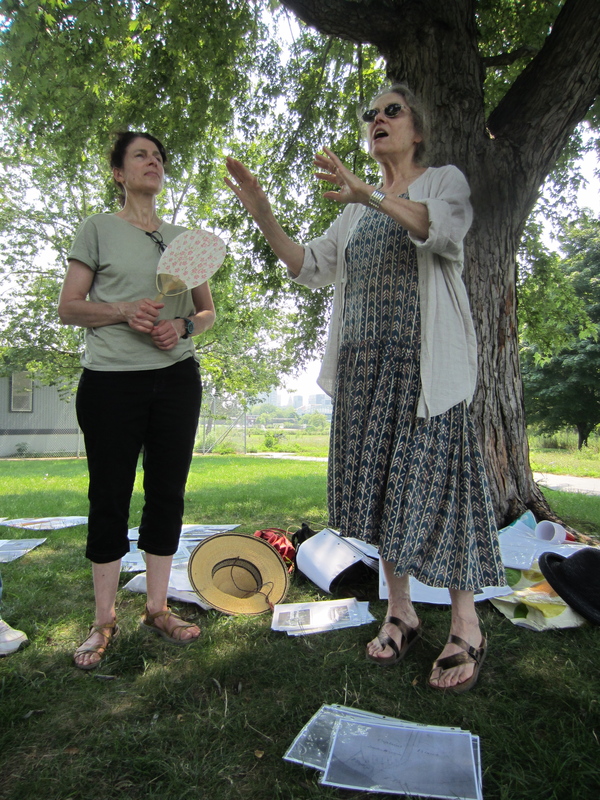 At our June 15th Celebration we debuted History on the Charles: The Story of Captain’s Island and its Powder Magazine, by Nina S. Cohen and Marilyn Wellons. This fascinating history is the result of over a year of primary research and study. A limited number of paper copies are available for $5 by contacting me at cathzusy@gmail.com. The 14-page booklet is also available on-line at http://www.magazinebeach.wordpress.com. Click on History. Thanks to Nina and Marilyn for their scholarship and to Michael Schaffer, Brian Conway and Sarah Morris for their design work and editing.